This extension for Magento will allow the administration to enable or disable the Maintenance mode for the store. Display maintenance page as per the options set from system settings. This extension maintains a log file of all the visitors that hit your site during maintenance mode. Enable timer during maintenance mode and site will be live automatically after countdown is over. This extension will also provide the ability to allow store access to particular IP address when store is under maintenance period. It will also allow to set redirection to a specific URL. Admin can also embed analytic code to track visitors information. 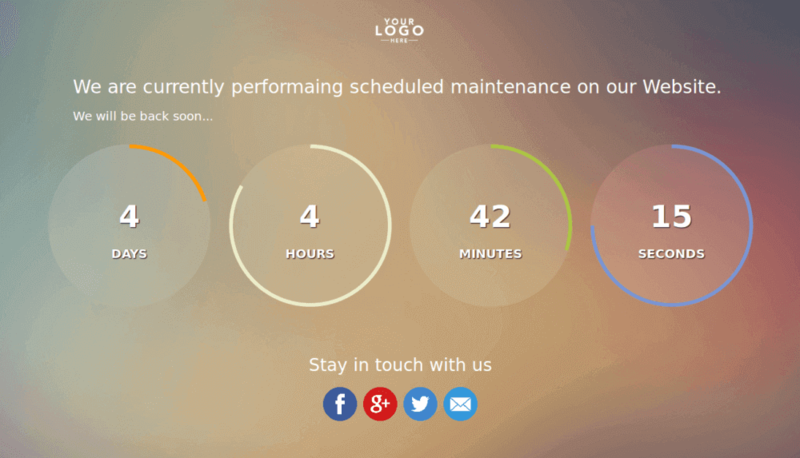 This extension will allow the administration to on or off the Maintenance mode for the website. Automatically fits to all mobile devices screen size and give a awesome look to the page. Get top social icons and email added to your list. Keep track of your visitors information. 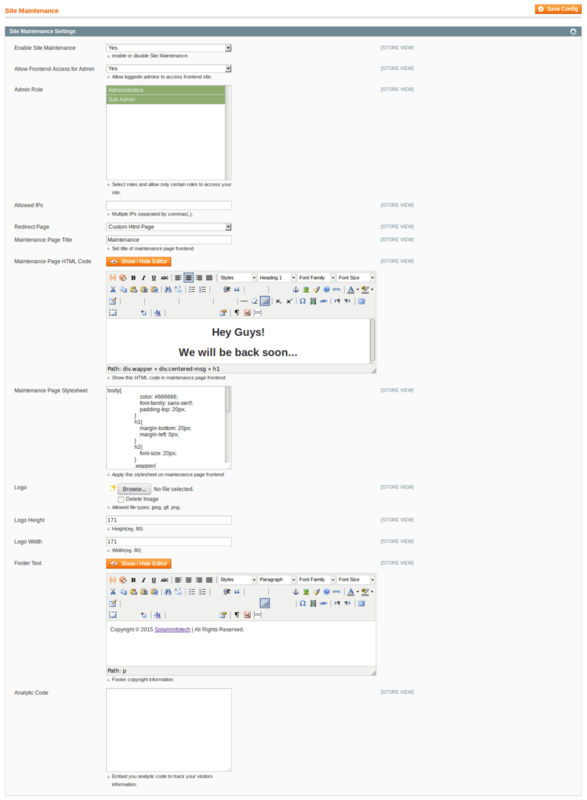 First time user of Site Maintenance Extension for my Magento site and I was so impressed. I bought a site maintenance extension cheaper than anywhere else and still contains great features and fulfill my all requirement. 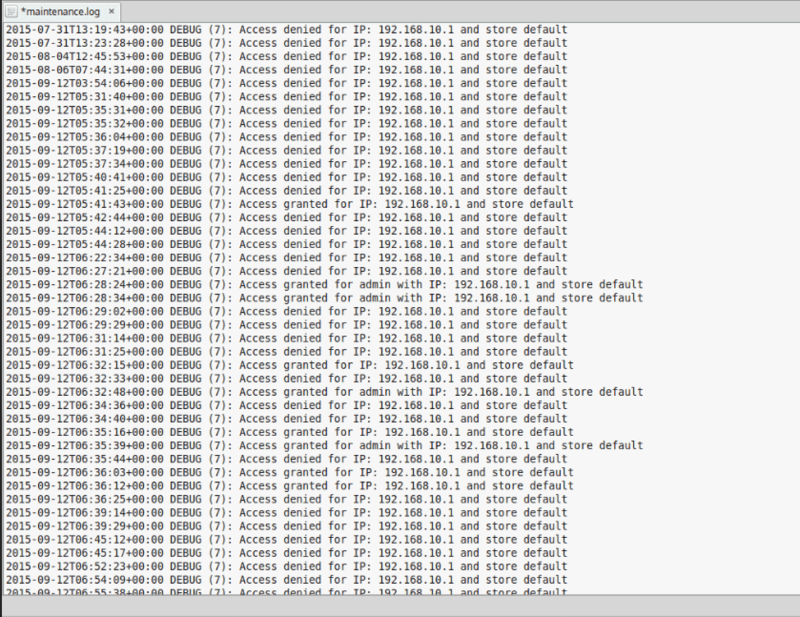 Allowed IPs: List of comma separated IP. Allow to access store in Maintenance Mode. Footer text: Enter Footer copyright information. Analytic Code: Embed your analytics code to track your visitors information. If Background is ‘Slider’ than you can add multiple banner images with title. Progress Bar Width: Enter progress bar width in percentage(%). Default is 50. Progress Color: Choose completed progress color. Text After: Add text after current progress amount. When I enable maintenance mode, I can access my backend to change my configurations, but I can´t see my site. I see the maintenance page.How do I view the changes I made to my site during maintenance mode? Yes. You can see your site changes. Go to Admin -> System -> Configuration -> Solwin -> Site Maintenance. and Enter your IP address in “Allowed IPs” field. Can i redirect my site to custom URL when i set my site under maintenance mode. Yes. You can redirect your site to custom URL. Go to Admin -> System -> Configuration -> Solwin -> Site Maintenance. Select Redirect Page -> Custom URL and Enter your custom URL. Can i set timer on Maintenance page? Yes. you can set timer on Maintenance page.